A lot of casual "science" falls far short of scientific. Scientific method requires falsifiability of all hypotheses. Otherwise, all experimental conclusions are circumstantial. Regarding the human body's joints, tissues and organs we have some working knowledge, and a lot of medically relevant conjecture, which assists in treating conditions we deem unacceptable ("sickness," "abnormality," "impairment," and "dysfunction.") But how do we determine the norm and criteria for health, correct form and function of the body, and furthermore the mind and behavior? The history of medicine shows how often our views of body, mind and "health" have changed. 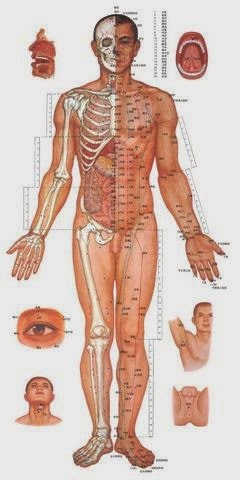 Our perception of what is inside, composing, and surrounding the body is contextual, culturally. For example, are you able to feel qi? Can you move prana through your shishumne nadi? Maybe you've received diagnosis that there is stagnance in your triple burner, or seen medieval drawings of a five lobed liver? Our perceptions of what is physically immutable about the body rely on cultural reality to establish expectations, toward which any particular body tends either to conform or not. Practicing yoga asana, meaning poses, can change joint alignment and muscle length, strength and endurance, promote more efficient respiration, and alter biochemically induced (really, any) moods. Allopathic medicine, supported by "Western science", "proves" these benefits occur with as little as 15 minutes of yoga pose practice per day. So, of course, you should be totally convinced. Right. Using the asana (pose) practice diagrams and descriptions for physical guidance helps busy-minded and body-minded folks connect breath (called "prana" which also means energy) with body position and thought process. Through this union the practitioner gets ready for meditation, whether seated, still, or moving. Some say this is yoga's oldest purpose: to unite our perceived being into an awareness that contemplates, and is represented by, a single point. Then, to remove the point. Yoga history describes this union in terms of a transcendent divine that connects with the meat-brain of the physical body when we control our thoughts and movement through breath. "Yoga may be defined as any practice involving the body, but ultimately it boils down to a process of embodying divine consciousness." The Hindu Yogi Science of Breath (pdf) (project gutenberg) describes the long-standing evidence -- from baseline physical to esoteric -- that "breath is life." This blog presents the background, the science and story, of yoga's approach to knowing the body.